Designed specifically for transfer of LP-Gas and Anhydrous Ammonia in pressure car service. The A7814 Angle Valve and A3214 Check Valve provides consistent and reliable protection in the event of a rollover accident. Should the Angle Valve shear off, the Check Valve automatically engages preventing any type of release. Engineered to for easy installation and minimal maintenance. The Angle Valve and Check Valves can be serviced without being removed from the cover plate. The combined heavyweight castings and precision machining provide superior strength, ruggedness and performance in working pressures up to 400psig. Provides almost 300% more flow compared to existing plug valves. While these valves have been in service since 2009 on numerous international fleets of ISO containers, they are currently undergoing AAR service trials. If you would like to be included in the service trials please contact Transquip. 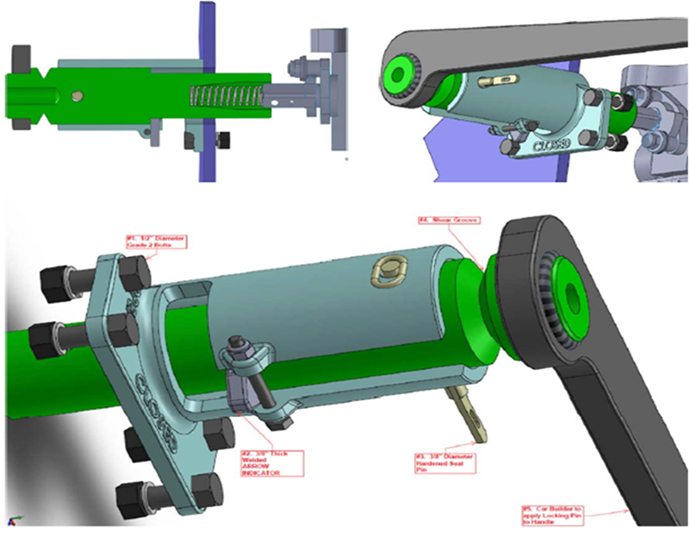 Transquip was among the first to design the new mandated disengaging BOV handles. Our design is specifically engineered in conjunction with and the only approved handle for the Jamesbury range of Bottom Outlet Valves. Designed and engineered to completely eliminate Non Accident Releases (NARs) as well as reduce gasket and labor costs by 95%. This innovative single bolt, metal-to-metal closure employs a universally chemical compatible encapsulated O-ring that sits on a retaining groove within shear ring of the cover. This system is approved for use with impact wrenches, has no torque requirements takes less than 2 minutes to open and close. The O-Ring is never compressed and field testing to date has seen O-Rings last over 1 year (over 12 turns) and still not need replacing. Introducing a more robust and easily applied solution to rubber coating… TranZcoat is a Blend of Polyvinyl’s that exhibits a Superior Quality Coating and is used as a protective coating in many acid environments today. TranZcoat Completely seals 100% of all surfaces exposed to Service Equipment in Acid and Corrosive Environments and has a Hardness of 80-85 Durometer Shore A. It is currently used in food grade applications regulated under the provisions of the Food and Drug Act and amendments a s Outlined in Title 21 of the Code Federal Regulations. Suitable for FDA Products.